The 18th Annual GRAMMY Block Party hosted approximately 1,000 guests this month in Nashville. This special GRAMMY member celebration featured performances by Kelsea Ballerini, Jason Isbell, Jonathan McReynolds, Robert Randolph and a guest performance by GRAMMY U Songwriter Showdown winner, Brad Blackburn. 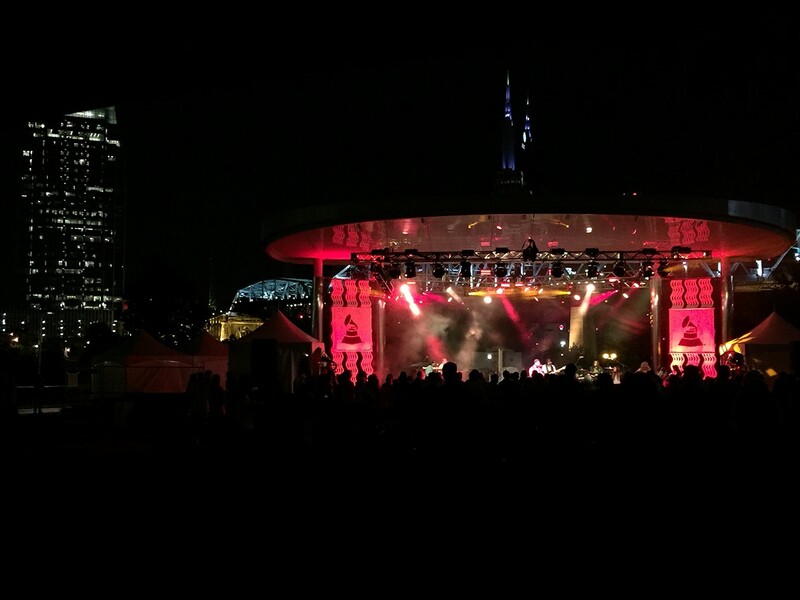 Held outdoors in Cumberland Park, with the Cumberland River as a backdrop, Chris Lisle Lighting Design relied on new Martin by HARMAN Atomic 3000 LED Strobes and classic MAC Auras to create a larger-than-life experience for this important guest list. In addition to being a powerful strobe, the Atomic 3000 LED is also a creative tool that incorporates backlight illumination with RGB-controlled LEDs pointing into the reflector. It delivers stunning looks similar to the MAC Aura and the MAC Quantum Wash. Internal FX macros and simplified reuse of the original Atomic Colors scroller complete the full-feature package, making the Atomic 3000 LED the ultimate creative lighting tool. For this event, Lisle used six Martin Atomic 3000 LED fixtures and 12 Martin Mac Auras. The Atomic 3000 LEDs were used as powerful strobes to add impact, texture and eye-candy to the stage. The Martin Atomic 3000 LED is the perfect blend of a traditional strobe and cutting-edge LED technology. Capitalizing on the original Atomic 3000 DMX’s 15 years of success, this new version features identical functionality and behavior—with the added benefits of LED technology. It offers the same extreme brightness as its iconic predecessor, but with substantially lower peak power consumption. Chris Lisle has more than 25 years experience in the entertainment industry and has worked in a variety of roles, including Production Designer, Lighting Designer, Tour Manager, Production Manager and Show Producer. Some of Chris’s present and past clients include Robert Plant, Miranda Lambert, One Republic, Billy Currington, Peter Frampton, Nick Carter, Kenny “Babyface” Edmonds, Chris Young, Jennifer Nettles, Lee Brice, Kip Moore, Nashville Convention and Visitors Bureau, IEBA, Sara Evans, Keith Urban, LeAnn Rimes, Lee Ann Womack, Phil Vassar, The Recording Academy (GRAMMYS) and many others. Chris is the founder of the Touring Career Workshop and also an adjunct instructor at Belmont University, teaching a class on Tour/Production Management.